Screening for behavioral health needs on early contact with youth in juvenile justice settings has become standard practice nationwide—at intake in probation, detention centers, or juvenile corrections programs. Identifying young people’s behavioral health needs—mental health, substance use, trauma-related problems, and suicide ideation—is important at that initial contact. It‘s the first step for identifying those who need immediate attention and further assessment for behavioral health needs. NYSAP has the experience and expertise to assist you in selecting and putting in place behavioral health screening and assessment tools in juvenile probation, detention and corrections programs. We’ve been consulted by juvenile justice programs throughout the U.S. for 15 years. We know how to help you decide what’s best for you and the young people you work with. 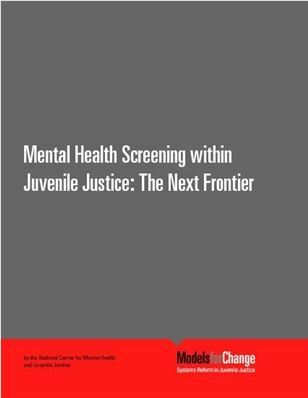 NYSAP offers consultation on the full range of mental health, substance use, and trauma-related screening tools designed for juvenile justice settings. 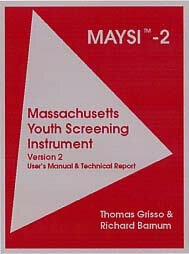 In addition, we have developed the Massachusetts Youth Screening Instrument-Second Version (MAYSI-2), currently the most widely-used behavioral health screening tool in juvenile justice programs nationwide. Click HERE and on links below to learn more about the MAYSI. But we know that program needs vary, and our main interest is in helping you select and implement methods that are best for your situation. Amy Wevodau, Ph.D., Keith Cruise, Ph.D., M.L.S., & Thomas Grisso, Ph.D.
Analyzing the results of screening in your agency, to obtain a profile of the behavioral health needs of young people in your agency’s care. For more information about our behavioral health screening consultation and training services, please contact us or complete and submit our request form. You will receive a response within one to two business days. For more information on the MAYSI-2 and our recently developed Web MAYSI-2, please click on the links below.